I love January and all that it represents – a clean, fresh start. A time to declutter, finish DIY jobs, sweep the leaves up in the garden. I’m making lists of my home projects, planning my next move with house renovations, and designing my planting scheme for my front garden. Decluttering is the easiest and quickest way to make a difference to your home, and great storage is essential for hiding away stuff – stuff that we really need, but needn’t be out on show. So when the lovely people at Out There Interiors asked me if I’d like to take part in their #MyCountryStyle challenge, I jumped at the chance. They invited me to to choose a small piece of furniture from their range, and to style it or upcycle it in a way to make it work for me in my home. 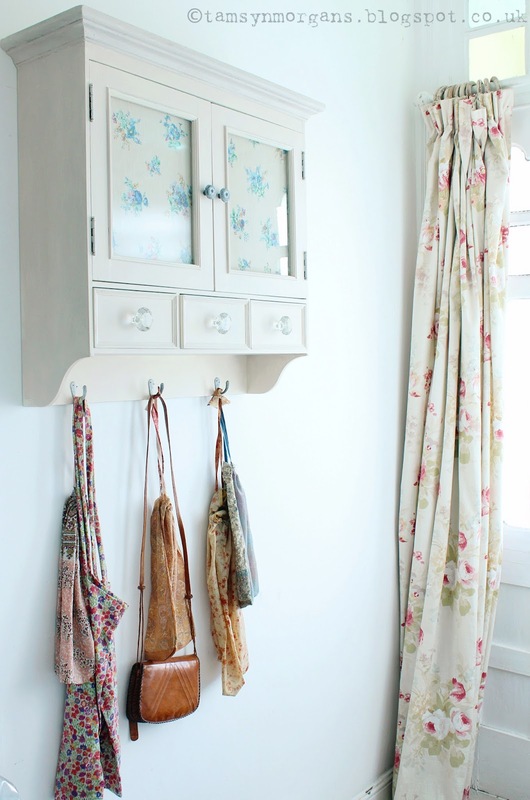 It was tricky to choose from their gorgeous selection of quirky, rustic and shabby chic style pieces, but in the end I chose this fab cupboard which is now proudly displayed in my hallway – perfect for hiding away the sort of clutter that usually accumulates in hallways. Keys, sunglasses, reusable shopping bags and other bits and bobs. 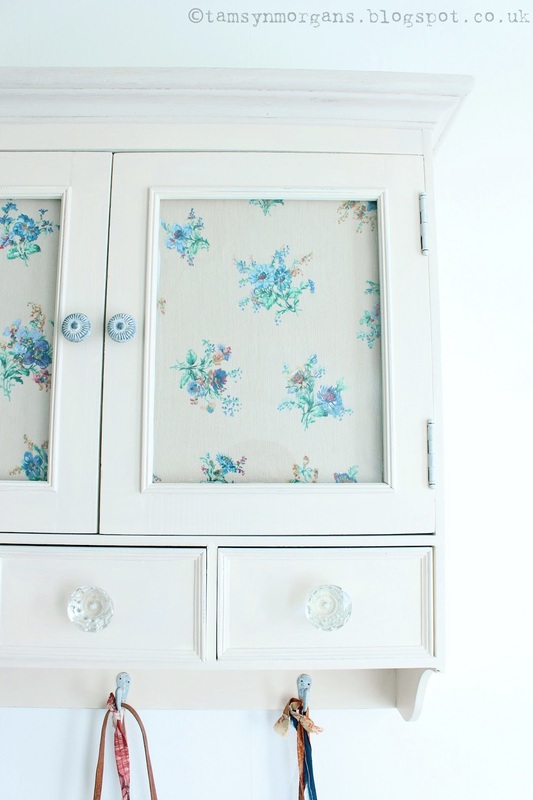 I love the simple shape of the cupboard, and all I really did was give a wash of pale grey paint, add vintage style glass handles and some pretty floral fabric behind the glass. 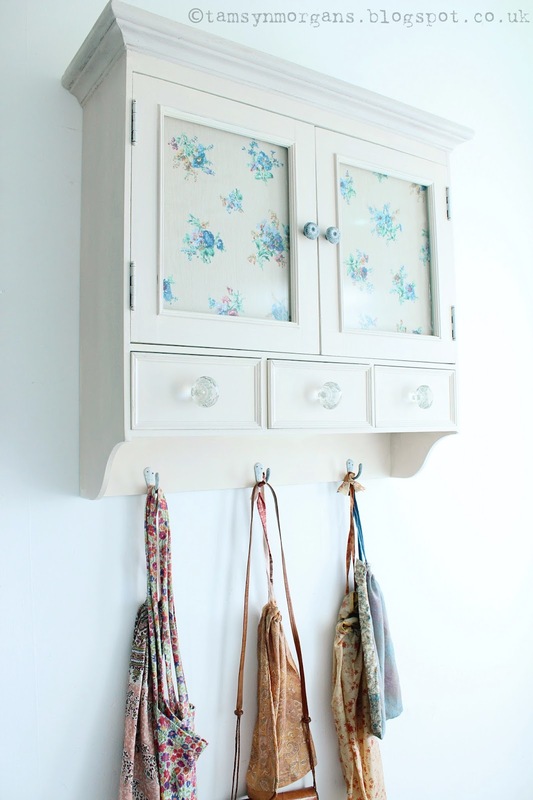 I’m also a little bit in love with their wire storage rack and drawer cabinet, both practical but pretty, and proof that storage really doesn’t need to be dull! I hope you like the new blog layout – I’m really pleased with it and hope that it’s easy for you readers to use. If you hover over the centre of any of my images a new ‘Pin it’ button will appear, so please do pin away!